If you are looking for a Real Carpet Cleaning Special in Birmingham AL, check out Heaven’s Best Carpet & Rug Cleaners. 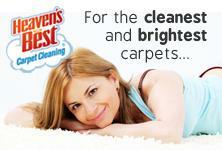 Heaven’s Best is a quality, affordable carpet cleaner that you can trust. And if you want real value for your money, try our $87 – 3 Room Carpet Cleaning Special! Our $87 – 3 Room Carpet Special includes Commercial Vacuuming, Pre-conditioning or Pre-spray, our unique Heaven’s Best Cleaning solution, Citrus Deodorizer and Carpet Grooming. All of this is included in the $87 price, and this is for up to 600 Sq. Ft of space. At Heaven's Best we work hard to be on time, clean your carpets thoroughly, and take care of you the way we would want to be treated. Heaven's Best is a Veteran-owned, family run, faith based, customer-driven business. We offer quality service at affordable prices. Our low moisture process dries in only 1 hour and is safe for pets, children, and the environment. At Heaven’s Best, our goal is to turn every customer into a lifetime business relationship. We know carpet cleaning makes your carpets look and feel so good they are like new. We also know that you do not always have the whole day to wait in “windows” for your appointment and then another whole day for your carpets to dry. That is why Heaven’s Best offers firm appointments and a unique, low-moisture carpet cleaning system that leaves your carpet dry in one hour! We use safe, environmentally-friendly cleaning solutions to deliver exceptional results while dramatically reducing the typical carpet cleaning dry times. Call Heaven’s Best Carpet Cleaning of Birmingham today at (205) 618-9150. You can’t beat our $87 Carpet Cleaning Special in Birmingham AL.